How has the apprentice been here that long! and a very colourful Llama who did not know what was about to happen. even though half the original band are now dead, Pink Floyd never sounded this good. 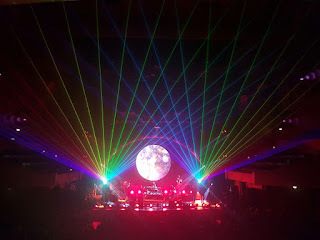 Blew Aussie Floyd off the stage as far as yours truly is concerned! the views haven't changed, just the maze through the gorse bushes has altered slightly through lack of use by yours truly. Not like Kilimanjaro but steep enough to raise the pulse and get the heart rate up. 6 of the 8 peaks challenge. Gladestry in the middle distance. Sheep skull lane has a new one, this is definitely not sheep, my guess its a badger. Or an ex badger to be accurate. Someone has taken a distinct dislike to the hedge that runs along sheeps skull lane. So much so that its here, gone. Looks like the look out had better lookout! We went off site today into the world as part of my beautiful and oh so patient wife's training schedule for her three peaks challenge. Across the valley from us is a huge hill, 1 metre short of the require 600 metres to be a mountain, the views from it are spectacular. But not today, the higher we got the colder it got and snow arrived. Curiously our dogs got bigger too! After a successful summit we headed into the giant forest, the trees suitably frozen. Our dogs, now normal sized loved the chance to explore a whole new world! Fanally some good weather on an early doors patrol. Mighty midget Misty using her one horse power to stop Stan in his tracks. Hint from Bryn hes not been fed. Noel and Elf with a vermin cat.